Background: Natural orifice translumenal endoscopic surgery (NOTES) introduces a paradigm shift in minimally invasive surgery that may benefit patients with decreased post-operative pain, faster recovery, better cosmesis, and less surgical morbidity by reducing abdominal incisions. While several NOTES and hybrid-NOTES cholecystectomies have been performed throughout the world, much research is needed to refine the technique, create instrumentation designedly for NOTES, and better determine which patients are candidates for NOTES cholecystectomies. 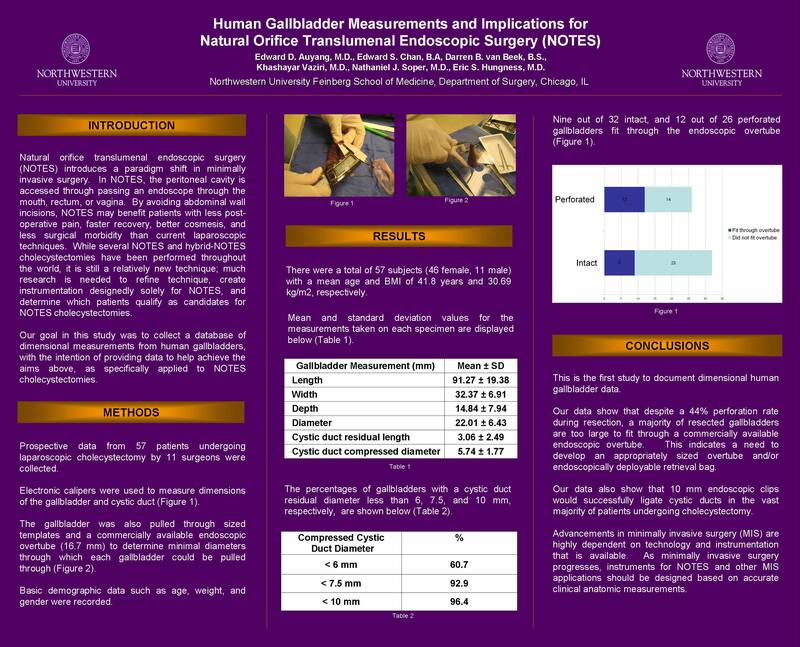 Our goal in this study was to collect a database of dimensional measurements from human gallbladders, with the intention of providing data to help address these needs as specifically applied to NOTES cholecystectomies. Methods: Prospective data from 57 patients undergoing laparoscopic cholecystectomy were collected. Electronic calipers were used to measure physical dimensions of the gallbladder and cystic duct. The gallbladder was also pulled through sized templates and a commercially available endoscopic overtube (16.7 mm) to determine minimal diameters through which each gallbladder could be pulled through. Basic demographic data such as age, weight, and gender were recorded. Results: There were a total of 57 subjects (46 female, 11 male) with a mean age and BMI of 41.8 years and 30.69 kg/m2, respectively. Thirty two (56%) of gallbladders remained intact after resection while 25 (44%) were perforated during dissection. Mean values were calculated for gallbladder length (91.27±19.38 mm), width (32.37±6.91 mm), and depth (14.84±7.94 mm), as well as for residual cystic duct length (3.06±2.49 mm) and diameter (5.74±1.77 mm). The mean gallbladder diameters based on pulling through our template was 22.01±6.43 mm. Nine out of 32 intact gallbladders could be passed through the endoscopic overtube, while 12/26 of the non-intact ones could be passed through. Cystic duct diameters were greater than 6 mm, 7.5 mm, and 10 mm in 60.7%, 92.9%, and 96.4% of the specimens, respectively. Conclusion: This is the first study to document dimensional human gallbladder data that may be useful in the development of NOTES. Our data shows that despite a 44% perforation rate during resection, a majority of resected gallbladders are too large to fit through a commercially available endoscopic overtube, indicating a need to develop an appropriately sized overtube and/or endoscopically deployable retrieval bag. Our data also show that 10 mm endoscopic clips would successfully ligate cystic ducts in the majority of patients undergoing cholecystectomy. Future endeavors include continuing the collection of samples to expand the database, and comparing predicted gallbladder sizes from ultrasound findings with their actual sizes; the latter could help determine if ultrasound analyses may be used effectively to predict eligible candidates for NOTES cholecystectomies.